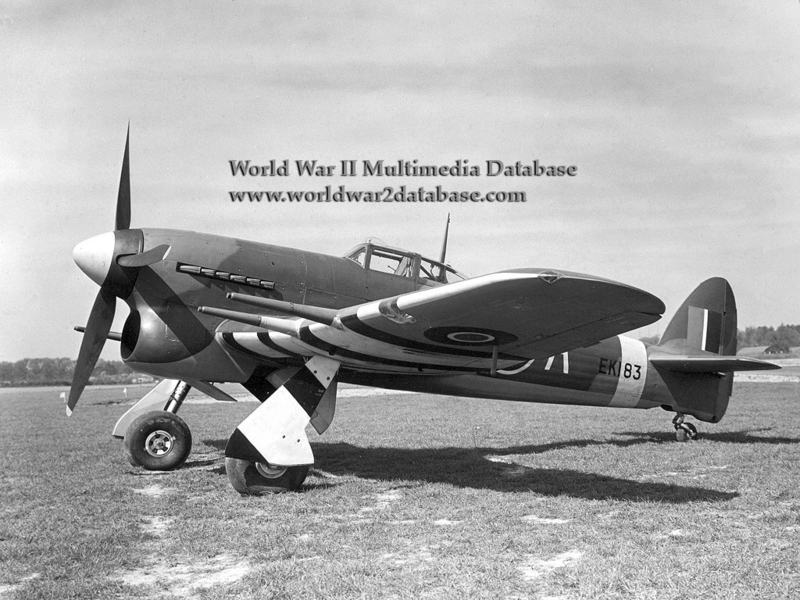 Royal Air Force Hawker Typhoon Ib US-A (EK183) of 56 Squadron, flown by Squadron Leader Thomas Henry Vicent "THV" Pheloung (August 31, 1914 - June 20, 1943) of Oamaru, New Zealand. This view was taken on the day the Typhoon was shown to the press. Pheloung took command of 56 Squadron on January 17, 1943. Pheloung was killed attacking a German convoy off the coast of the Netherlands; flak from the ships hit his aircraft (he was flying EK174 at the time) and trying to return to England, his men watched his aircraft flip over and plunge into the sea. 56 Squadron was the first unit to fly the Typhoon in May 1942. The Typhoon was the replacement for the Hawker Hurricane, but troubles with development limited its performance; the tailplane had to be strengthened after a number of accidents involving loss of the tailplane during high speed dives. The large chin air intake for the Napier Sabre engine can be seen behind the propeller. The engine also was prone to catching fire. EK183 had a "car door" canopy, where the pilot would enter through the side of the aircraft. This was changed to a "bubbletop" canopy for better visibility and ease of escape in case of bailout. The alternating bands of white and black on the wings were ordered applied to the Typhoon in December 1942 because Allied pilots had trouble distinguishing between the Typhoon and the German Focke-Wulf FW-190. The propeller spinner was also painted light gray ("sky") for further identification. The Typhoon 1a was armed with twelve Browning .303 machine guns; the 1b variant was armed with four Hispano 20mm cannon, which can be seen in the wings in this view. Typhoons were armed with rockets and bombs ("Bombphoons") and were highly successful ground attack platforms. The Hawker Tempest eliminated many of the Typhoon's problems and was a successful fighter into the 1950s.